Since 1964 the California Professional Horsemen's Association has represented professional horsemen in California. The CPHA provides a forum, voice, and many valuable programs and benefits for professionals working in California's large equestrian industry. Through its many programs and benefits, the CPHA effectively reaches all professional members of California's show horse community. CPHA professionals can partake in programs like the excess accident insurance and receiving discounts for the H2B Visa Program, which enables grooms and stable hands from foreign countries to work legally in the United States. The CPHA is a not for profit organization and horse show community comprised of professional horsemen and other equestrian related individuals who make at least 50% of their income from equestrian related activities. The CPHA is committed to providing educational, developmental and benefiting programs in support of its professional members. 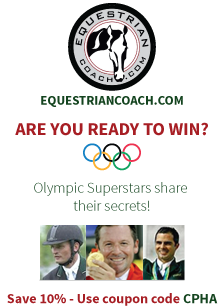 It strives to foster amateur equestrian sports and further works to continually improve horse show participation and the well being of the show horse. Click here to read more on the CPHA purpose. Welcome to the CPHA Website. Be sure and visit the announcement page for all updated information. See our medal page for medal specifications, the year end tab for year end recipients and our new resource page for companies and ideas to help you in your business.